Combined broad-spectrum drug to treat ectoparasitic, fungal, bacterial and invasion diseases in ornamental fish. 20 ml polymeric dropper bottle. Outer package - carton. 1 l polymeric bottle. The drug is manufactured in bottles of volume easy to be administered. Provides unique healing properties in affected tissues. The drug is safe for aquatic vegetation. 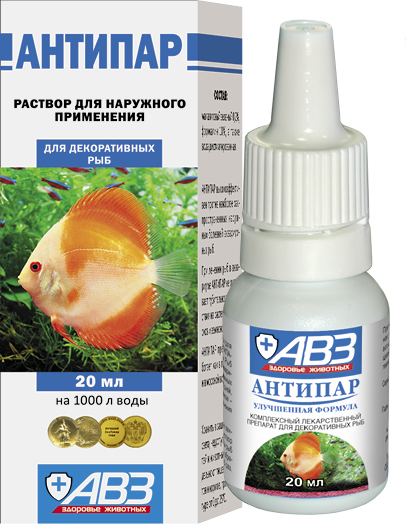 Antipar is a combined antiseptic drug for external processing of aquarium fish (improved formula). The drug contains active ingredients (malachite green - 0.2% and formalin - 10%) which provide harmful effect on agents of bacterial and fungal infections, protozoans and worms (localized on cover tissues of body, branchiae and fins), as well as promote healing of traumatic tissue injuries. Mechanism of drug action is based on binding of intracellular cytoplasmic structures with malachite green and denaturation of proteins with formalin totally damaging metabolism of disease agents and causing their death. Use in saprolegniosis, ichthyophthiriasis, white spot disease, trichodiniasis, velvet disease, amyloodinosis, costiasis, chilodotiasis, brooklynellosis, trichophryasis, apiosomosis and other ectoprotozoan and mycotic diseases in aquarium fish. Do not use in fish with damaged cover tissues. The drug is badly tolerated by scaleless fish and several type of sea ones, so it must be used carefully. Do not use in commercial fish and in aquariums with invertebrate aquatic organisms. It is not allowed to use with drugs containing salts of silver, mercury and copper, as well as oxidants and alkalies. Prevention: single short-term bath (1 ml per 10 l of water); exposure is 3 hours. Treatment: short-term baths, twice, 24 hours apart (1 ml per 10 l of water), exposure is 3 hours; long-term baths (1 ml per 50 l of water), exposure is 3-8 days (until clinical signs of disease disappear). According to package insert, carry out tolerance test before use the dug. In order to treat high-sensitivity fish, perform treatment as per package insert. Water containing dissolved drug obtains petrol blue colouration. Overdose: potential disorders of balance and motion coordination (for example, fast chaotic swimming). In this case immediately transfer fish into a tank with clean water. Store at 0-25°С. Protect from light and moisture. Shelf life is 2 years from manufacturing date.